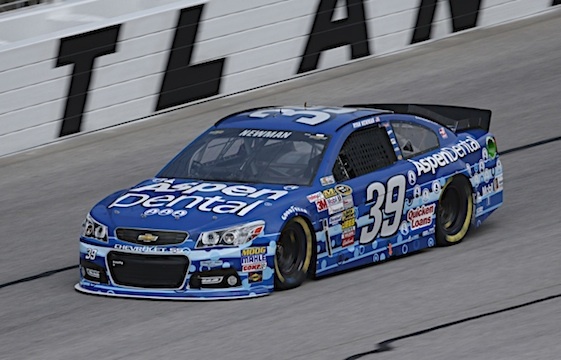 HAMPTON, Ga. – Ryan Newman’s Saturday at Atlanta Motor Speedway started off much the same as his Friday, when he headed down the road to visit the Noah’s Ark animal sanctuary with his wife and daughters. “We were up at 8:30, out the door at 9:30 and at Noah’s Ark by 10,” Newman said. There, he helped staff members work with ostriches and emus and even fed seven rather large alligators a meal of meat – three five-gallon bucketfuls. He said he wasn’t too worried about getting eaten alive. “As long as the people at Noah’s Ark knew the gators, I felt like I knew them,” he said, adding that he got up close to the powerful critters while providing them their dinner. 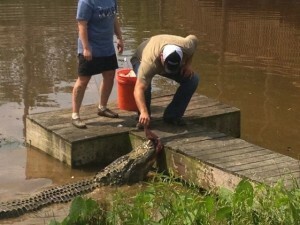 “I had my hand on one side of the meat while the other end was touching the gator’s nose,” he said. Newman compared feeding gators to racing in the draft at Talladega Superspeedway. “When you get it driving good in the daytime, it should drive even better after dark,” he said. Once practice is done, Newman planned a low-key evening. “We’re just going to rest and relax, and play with the babies,” he said. And he was set to watch the Nationwide race going on outside his home away from home in the motorcoach lot in the AMS infield. But it won’t be from trackside. “I’m going to watch the air-conditioned Nationwide race,” he said.